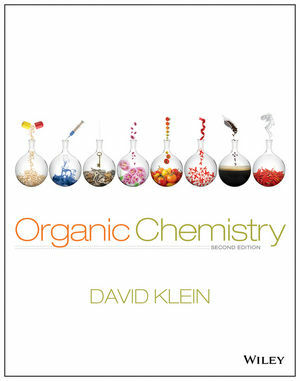 In Organic Chemistry, 2nd Edition, Dr. David Klein builds on his unique skills-based approach, including all of the concepts typically covered in an organic chemistry textbook, but placing special emphasis on skills development to support these concepts. This emphasis upon skills development provides two-semester Organic Chemistry students with a greater opportunity to develop proficiency in the key skills necessary to succeed in organic chemistry. David Klein is a lecturer at Johns Hopkins University where he teaches Organic and General Chemistry. He is a dynamic and creative teacher and uses analogy to help students grasp difficult topics. Klein's unique informal voice and manner of presentation help students truly master key topics in this course. He is also the author of Organic Chemistry as a Second Language and General Chemistry as a Second Language, which have both been highly successful. WileyPLUS is now equipped with an adaptive learning module called ORION. Based on cognitive science, WileyPLUS with ORION, provides students with a personal, adaptive learning experience so they can build their proficiency on topics and use their study time most effectively. WileyPLUS with ORION helps students learn by learning about them. Problems are based on the chemical literature (real-world laboratory reference provided for each one) and designed to be thought-provoking puzzles that are challenging, but possible to solve with the principles and skills developed in the textbook. WileyPLUS is a research-based online environment for effective teaching and learning. WileyPLUS is packed with interactive study tools and resources–including the complete online textbook–giving your students more value for their money. With WileyPLUS, students are provided with unique study strategies, tools, and support based on learning styles for success in Organic Chemistry. WileyPLUS hallmarks, such as Reaction Explorer, remain alongside brand-new course updates. Conceptual Checkpoints exercises appear after many sections to give students practice of the recently presented concepts. Approximately 100 Medically Speaking & Practically Speaking application boxes demonstrate relevancy of organic chemistry to medicine, current research, and the world around us. Chapter Openers contain a “Did You Ever Wonder” question that serve to capture the students’ interest. These questions are answered within that chapter.